Rolfing Library's Digital Collections contains material digitized from the EFCA Archives in Minneapolis, Minnesota and the Gleason Archer Archives in Rolfing Library. Through the links on the collections pages, visitors may browse and download digital material for private use. The presentation of these collections represents a partnership between Rolfing Library and the EFCA Archives with the goal of making widely available writings, documents, and images considered significant to the growth of the Evangelical Free Church of America and Trinity International University. The scope of the collections cover—among other things—the history, theology, missionary activity, sermons, and development of the EFCA denomination, its predecessors, and institutions. Users may browse through collections and download works freely. Keep in mind that there may be some restrictions on some items that will require contacting the library or the EFCA Archives for further permission. This project should be considered ongoing. More material and collections will be added to this site as time and resources allow. We welcome any and all questions and comments regarding our digital collections. If the question is regarding the digital collections (e.g. a request for a larger-resolution image, rights, corrections) please make sure to include "Digital Collections" in the subject line of the email. Rolfing Library's digital collections are hosted through the Consortium of Academic Research Libraries of Illinois (CARLI). CARLI hosts the collections of dozens of institutions and provides a platform for shared knowledge and scholarship across the state. 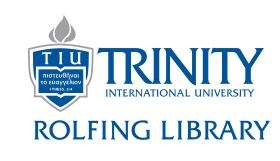 Trinity International University is a Governing Member of CARLI's participating libraries.